Pliny the Elder (/ˈplɪni/; born Gaius Plinius Secundus, AD 23–79) was a Roman author, naturalist and natural philosopher, a naval and army commander of the early Roman Empire, and friend of emperor Vespasian. For my part I deem those blessed to whom, by favour of the gods, it has been granted either to do what is worth writing of, or to write what is worth reading; above measure blessed those on whom both gifts have been conferred. In the latter number will be my uncle, by virtue of his own and of your compositions. 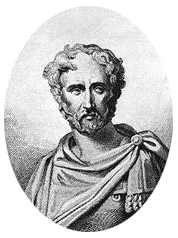 Pliny the Younger refers to Tacitus’s reliance upon his uncle's book, the History of the German Wars. Pliny the Elder died in AD 79 in Stabiae while attempting the rescue of a friend and his family by ship from the eruption of Mount Vesuvius, which already had destroyed the cities of Pompeii and Herculaneum. The wind caused by the sixth and largest pyroclastic surge of the volcano’s eruption did not allow his ship to leave port, and Pliny probably died during that event. One of the Xanten Horse-Phalerae located in the British Museum, measuring 10.5 cm (4.1 in). It bears an inscription formed from punched dots: PLINIO PRAEF EQ; i.e. Plinio praefecto equitum, "Pliny prefect of cavalry". It was perhaps issued to every man in Pliny's unit. The figure is the bust of the emperor. Pliny's dates are pinned to the eruption of Mount Vesuvius in AD 79 and a statement of his nephew that he died in his 56th year, which would put his birth in AD 23 or 24. "Plinius Secundus augur ordered this to be made as a testament to his father [Ce]ler and his mother [Grania] Marcella"
The actual words are fragmentary. The reading of the inscription depends on the reconstruction, but in all cases the names come through. Whether he was an augur and whether she was named Grania Marcella are less certain. Jean Hardouin presents a statement from an unknown source that he claims was ancient, that Pliny was from Verona and that his parents were Celer and Marcella. Hardouin also cites the conterraneity (see below) of Catullus. How the inscription got to Verona is unknown, but it could have arrived by dispersal of property from Pliny the Younger's then Tuscan (now Umbrian) estate at Colle Plinio, north of Città di Castello, identified for certain by his initials in the roof tiles. He kept statues of his ancestors there. Pliny the Elder was born at Como, not at Verona: it is only as a native of old Gallia Transpadana that he calls Catullus of Verona his conterraneus, or fellow-countryman, not his municeps, or fellow-townsman. A statue of Pliny on the façade of the Duomo of Como celebrates him as a native son. He had a sister, Plinia, who married into the Caecilii and was the mother of his nephew, Pliny the Younger, whose letters describe his work and study regimen in detail. In one of his letters to Tacitus (avunculus meus), Pliny the Younger details how his uncle's breakfasts would be light and simple (levis et facilis) following the customs of our forefathers (veterum more interdiu). This shows that Pliny the Younger wanted it to be conveyed that Pliny the Elder was a "good Roman", which means that he maintained the customs of the great Roman forefathers. This statement would have pleased Tacitus. Two inscriptions identifying the hometown of Pliny the Younger as Como take precedence over the Verona theory. One (CIL V 5262) commemorates the younger's career as the imperial magistrate and details his considerable charitable and municipal expenses on behalf of the people of Como. Another (CIL V 5667) identifies his father Lucius' village as Fecchio (tribe Oufentina) near Como. Therefore, Plinia likely was a local girl and Pliny the Elder, her brother, was from Como. Gaius was a member of the Plinia gens: the insubric root Plina still persists, with rhotacism, in the local surname "Prina". He did not take his father's cognomen, Celer, but assumed his own, Secundus. As his adopted son took the same cognomen, Pliny founded a branch, the Plinii Secundi. The family was prosperous; Pliny the Younger's combined inherited estates made him so wealthy that he could found a school and a library, endow a fund to feed the women and children of Como, and own multiple estates around Rome and Lake Como, as well as enrich some of his friends as a personal favor. No earlier instances of the Plinii are known. In 59 BC, only about 82 years before Pliny's birth, Julius Caesar founded Novum Comum (reverting to Comum) as a colonia to secure the region against the Alpine tribes, whom he had been unable to defeat. He imported a population of 4,500 from other provinces (not clear from where) to be placed in Comasco and 500 aristocratic Greeks to found Novum Comum itself. The community was thus multi-ethnic and the Plinies could have come from anywhere; whether any conclusions can be drawn from Pliny's preference for Greek words, or Julius Pokorny's derivation of the name from north Italic as "bald" is a matter of speculative opinion. No record of any ethnic distinctions in Pliny's time is apparent. The population prided themselves on being Roman citizens. Pliny the Elder did not marry and had no children. In his will, he adopted his nephew, which entitled the latter to inherit the entire estate. The adoption is called a "testamental adoption" by writers on the topic, who assert that it applied to the name change only, but Roman jurisprudence recognizes no such category. Pliny the Younger thus became the adopted son of Pliny the Elder after the latter's death. For at least some of the time, however, Pliny the Elder resided under the same roof with his sister and nephew (whose husband and father, respectively, had died young); they were living there when Pliny the Elder decided to investigate the eruption of Mount Vesuvius, and was sidetracked by the need for rescue operations and a messenger from his friend asking for assistance. Pliny's father took him to Rome to be educated in lawmaking. Pliny relates that he saw Marcus Servilius Nonianus. Pliny the Elder, as imagined by a 19th-century artist: No contemporary depiction of Pliny is known to survive. In AD 46, at about age 23, Pliny entered the army as a junior officer, as was the custom for young men of equestrian rank. Ronald Syme, Plinian scholar, reconstructs three periods at three ranks. Pliny's interest in Roman literature attracted the attention and friendship of other men of letters in the higher ranks, with whom he formed lasting friendships. Later, these friendships assisted his entry into the upper echelons of the state; however, he was trusted for his knowledge and ability, as well. According to Syme, he began as a praefectus cohortis, a "commander of a cohort" (an infantry cohort, as junior officers began in the infantry), under Gnaeus Domitius Corbulo, himself a writer (whose works did not survive) in Germania Inferior. In AD 47, he took part in the Roman conquest of the Chauci and the construction of the canal between the rivers Maas and Rhine. His description of the Roman ships anchored in the stream overnight having to ward off floating trees has the stamp of an eyewitness account. Map of Castra Vetera, a large permanent base (castra stativa) of Germania Inferior, where Pliny spent the last of his 10-year enlistment as a cavalry commander: The proximity of a naval base there means that he trained also in ships, as the Romans customarily trained all soldiers in all arms whenever possible. The location is on the lower Rhine River. At some uncertain date, Pliny was transferred to the command of Germania Superior under Pomponius Secundus with a promotion to military tribune, which was a staff position, with duties assigned by the district commander. Pomponius was a half-brother of Corbulo. They had the same mother, Vistilia, a powerful matron of the Roman upper classes, who had seven children by six husbands, some of whom had imperial connections, including a future empress. Pliny's assignments are not clear, but he must have participated in the campaign against the Chatti of AD 50, at age 27, in his fourth year of service. Associated with the commander in the praetorium, he became a familiar and close friend of Pomponius, who also was a man of letters. At another uncertain date, Pliny was transferred back to Germania Inferior. Corbulo had moved on, assuming command in the east. This time, Pliny was promoted to praefectus alae, "commander of a wing", responsible for a cavalry battalion of about 480 men. He spent the rest of his military service there. 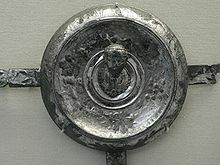 A decorative phalera, or piece of harness, with his name on it has been found at Castra Vetera, modern Xanten, then a large Roman army and naval base on the lower Rhine. Pliny's last commander there, apparently neither a man of letters nor a close friend of his, was Pompeius Paulinus, governor of Germania Inferior AD 55-58. Pliny relates that he personally knew Paulinus to have carried around 12,000 pounds of silver service on which to dine on campaign against the Germans (a practice which would not have endeared him to the disciplined Pliny). According to his nephew, during this period, he wrote his first book (perhaps in winter quarters when the more spare time was available), a work on the use of missiles on horseback, De jaculatione equestri. It has not survived, but in Natural History, he seems to reveal at least part of its content, using the movements of the horse to assist the javelin-man in throwing missiles while astride its back. During this period, he also dreamed that the spirit of Drusus Nero begged him to save his memory from oblivion. The dream prompted Pliny to begin forthwith a history of all the wars between the Romans and the Germans, which he did not complete for some years. At the earliest time Pliny could have left the service, Nero, the last of the Julio-Claudian dynasty, had been emperor for two years. He did not leave office until AD 68, when Pliny was 45 years old. During that time, Pliny did not hold any high office or work in the service of the state. In the subsequent Flavian Dynasty, his services were in such demand that he had to give up his law practice, which suggests that he had been trying not to attract the attention of Nero, who was a dangerous acquaintance. Under Nero, Pliny lived mainly in Rome. He mentions the map of Armenia and the neighbourhood of the Caspian Sea, which was sent to Rome by the staff of Corbulo in 58. He also saw the building of Nero's Domus Aurea or "Golden House" after the fire of 64. Besides pleading law cases, Pliny wrote, researched, and studied. His second published work was a biography of his old commander, Pomponius Secundus, in two books. After several years in prison under Tiberius, AD 31-37 (which he used to write tragedies), Pomponius was rehabilitated by Caligula (who later married his half-sister, Caesonia) in 38, made consul in 41, and sent by Claudius as legatus to Germany, where he won a victory against the Chatti in 50 and was allowed a triumph. After this peak, he disappears from history, never to be mentioned again, except by the Plinies, and is not among either the friends or the enemies of Nero. The elder Pliny mentions that he saw "in the possession of Pomponius Secundus, the poet, a very illustrious citizen", manuscripts in the "ancient handwriting of Tiberius and Caius Gracchus". The peak of Pomponius's fame would have been his triumph of 50 or 51. In 54, Nero came to power; at that time, Pliny was working on his two military writings. Pliny the Younger says that the biography of Pomponius was "a duty which he owed to the memory of his friend", implying that Pomponius had died. The circumstances of this duty and whether or not it had anything to do with his probable avoidance of Nero have disappeared with the work. Meanwhile, he was completing the 20 books of his History of the German Wars, the only authority expressly quoted in the first six books of the Annals of Tacitus, and probably one of the principal authorities for the same author's Germania. It disappeared in favor of the writings of Tacitus (which are far shorter), and, early in the fifth century, Symmachus had little hope of finding a copy. Like Caligula, Nero seemed to grow gradually more insane as his reign progressed. Pliny devoted much of his time to writing on the comparatively safe subjects of grammar and rhetoric. He published a three-book, six-volume educational manual on rhetoric, entitled Studiosus, "the Student". Pliny the Younger says of it: "The orator is trained from his very cradle and perfected." It was followed by eight books entitled Dubii sermonis, Of Doubtful Phraseology. These are both now lost works. His nephew relates: "He wrote this under Nero, in the last years of his reign, when every kind of literary pursuit which was in the least independent or elevated had been rendered dangerous by servitude." In 68, Nero no longer had any friends and supporters. He committed suicide, and the reign of terror was at an end, as was the interlude in Pliny's obligation to the state. At the end of AD 69, after a year of civil war consequent on the death of Nero, Vespasian, a successful general, became emperor. Like Pliny, he had come from the equestrian class, rising through the ranks of the army and public offices and defeating the other contenders for the highest office. His main tasks were to re-establish peace under imperial control and to place the economy on a sound footing. He needed in his administration all the loyalty and assistance he could find. Pliny, apparently trusted without question, perhaps (reading between the lines) recommended by Vespasian's son Titus, was put to work immediately and was kept in a continuous succession of the most distinguished procuratorships, according to Suetonius. A procurator was generally a governor of an imperial province. The empire was perpetually short of, and was always seeking, office holders for its numerous offices. "Before dawn he was going to the Emperor Vespasian (for he also made use of the night), then he did the other duties assigned to him". In this passage, Pliny the Younger conveys to Tacitus that his uncle was ever the academic, always working. The word ibat (imperfect, "he used to go") gives a sense of repeated or customary action. In the subsequent text, he mentions again how most of his uncle's day was spent working, reading, and writing. He notes that Pliny "was indeed a very ready sleeper, sometimes dropping off in the middle of his studies and then waking up again." A definitive study of the procuratorships of Pliny was compiled by the classical scholar Friedrich Münzer, which was reasserted by Ronald Syme and became a standard reference point. Münzer hypothesized four procuratorships, of which two are certainly attested and two are probable but not certain. However, two does not satisfy Suetonius' description of a continuous succession. Consequently, Plinian scholars present two to four procuratorships, the four comprising (i) Gallia Narbonensis in 70, (ii) Africa in 70-72, (iii) Hispania Tarraconensis in 72-74, and (iv) Gallia Belgica in 74-76. In the cultivation of the soil, the manners and civilization of the inhabitants, and the extent of its wealth, it is surpassed by none of the provinces, and, in short, might be more truthfully described as a part of Italy than as a province. denoting a general popular familiarity with the region. Pliny certainly spent some time in Africa Province, most likely as a procurator. Among other events or features that he saw are the provoking of rubetae, poisonous toads (Bufonidae), by the Psylli; the buildings made with molded earthen walls, "superior in solidity to any cement;" and the unusual, fertile seaside oasis of Gabès (then Tacape), Tunisia, currently a World Heritage Site. Syme assigns the African procuratorship to AD 70-72. The procuratorship of Hispania Tarraconensis was next. A statement by Pliny the Younger that his uncle was offered 400,000 sesterces for his manuscripts by Larcius Licinius while he (Pliny the Elder) was procurator of Hispania makes it the most certain of the three. Pliny lists the peoples of "Hither Hispania", including population statistics and civic rights (modern Asturias and Gallaecia). He stops short of mentioning them all for fear of "wearying the reader". As this is the only geographic region for which he gives this information, Syme hypothesizes that Pliny contributed to the census of Hither Hispania conducted in 73/74 by Vibius Crispus, legate from the Emperor, thus dating Pliny's procuratorship there. 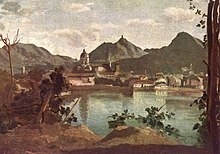 During his stay in Hispania, he became familiar with the agriculture and especially the gold mines of the north and west of the country. His descriptions of the various methods of mining appear to be eyewitness judging by the discussion of gold mining methods in his Natural History. He might have visited the mine excavated at Las Médulas. The last position of procurator, an uncertain one, was of Gallia Belgica, based on Pliny's familiarity with it. The capital of the province was Augusta Treverorum (Trier), named for the Treveri surrounding it. Pliny says that in "the year but one before this" a severe winter killed the first crops planted by the Treviri; they sowed again in March and had "a most abundant harvest." The problem is to identify "this", the year in which the passage was written. Using 77 as the date of composition Syme arrives at AD 74-75 as the date of the procuratorship, when Pliny is presumed to have witnessed these events. The argument is based entirely on presumptions; nevertheless, this date is required to achieve Suetonius' continuity of procuratorships, if the one in Gallia Belgica occurred. Pliny was allowed home (Rome) at some time in AD 75–76. He was presumably at home for the first official release of Natural History in 77. Whether he was in Rome for the dedication of Vespasian's Temple of Peace in the Forum in 75, which was in essence a museum for display of art works plundered by Nero and formerly adorning the Domus Aurea, is uncertain, as is his possible command of the vigiles (night watchmen), a lesser post. No actual post is discernible for this period. On the bare circumstances, he was an official agent of the emperor in a quasiprivate capacity. Perhaps he was between posts. In any case, his appointment as prefect of the fleet at Misenum took him there, where he resided with his sister and nephew. 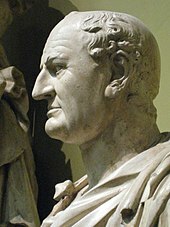 Vespasian died of disease on June 23, 79. Pliny outlived him by two months. During Nero's reign of terror, Pliny avoided working on any writing that would attract attention to himself. 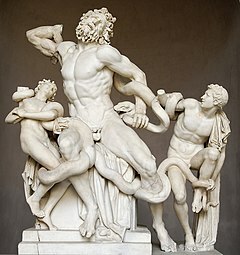 His works on oratory in the last years of Nero's reign (67, 68) focused on form rather than on content. He began working on content again probably after Vespasian's rule began in AD 69, when the terror clearly was over and would not be resumed. It was to some degree reinstituted (and later cancelled by his son Titus) when Vespasian suppressed the philosophers at Rome, but not Pliny, who was not among them, representing, as he says, something new in Rome, an encyclopedist (certainly, a venerable tradition outside Italy). In his next work, he "completed the history which Aufidius Bassus left unfinished, and... added to it thirty books." Aufidius Bassus was a cause célèbre according to Seneca the Younger, a man much admired at Rome. He had begun his history with some unknown date, certainly before the death of Cicero, so probably the Civil Wars or the death of Julius Caesar, ending with the reign of Tiberius. It was cut short when Bassus died slowly of a lingering disease, with such spirit and objectivity that Seneca remarked that Bassus seemed to treat it as someone else's dying. It has been long completed and its accuracy confirmed; but I have determined to commit the charge of it to my heirs, lest I should have been suspected, during my lifetime, of having been unduly influenced by ambition. By this means I confer an obligation on those who occupy the same ground with myself; and also on posterity, who, I am aware, will contend with me, as I have done with my predecessors. Pliny's last work, according to his nephew, was the Naturalis Historia (literally "Natural History"), an encyclopedia into which he collected much of the knowledge of his time. It comprised 37 books. His sources were personal experience, his own prior works (such as the work on Germany), and extracts from other works. These extracts were collected in the following manner: One servant would read aloud, and another would write the extract as dictated by Pliny. He is said to have dictated extracts while taking a bath. In winter, he furnished the copier with gloves and long sleeves so his writing hand would not stiffen with cold (Pliny the Younger in avunculus meus). His extract collection finally reached about 160 volumes, which Larcius Licinius, the Praetorian legate of Hispania Tarraconensis, vainly offered to purchase for 400,000 sesterces. That would have been in 73/74 (see above). Pliny bequeathed the extracts to his nephew. When composition of the Natural History began is unknown. Since he was preoccupied with his other works under Nero and then had to finish the history of his times, he is unlikely to have begun before 70. The procuratorships offered the ideal opportunity for an encyclopedic frame of mind. The date of an overall composition cannot be assigned to any one year. The dates of different parts must be determined, if they can, by philological analysis (the post mortem of the scholars). The closest known event to a single publication date, that is, when the manuscript was probably released to the public for borrowing and copying, and was probably sent to the Flavians, is the date of the Dedication in the first of the 37 books. It is to the imperator Titus. As Titus and Vespasian had the same name, Titus Flavius Vespasianus, earlier writers hypothesized a dedication to Vespasian. Pliny's mention of a brother (Domitian) and joint offices with a father, calling that father "great", points certainly to Titus. Pliny also says that Titus had been consul six times. The first six consulships of Titus are in 70, 72, 74, 75, 76, and 77, all conjointly with Vespasian, and the seventh was in 79. This brings the date of the Dedication probably to 77. In that year, Vespasian was 68. He had been ruling conjointly with Titus for some years. 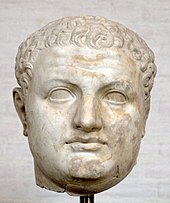 The title imperator does not indicate that Titus was sole emperor, but was awarded for a military victory, in this case that in Jerusalem in 70. Aside from minor finishing touches, the work in 37 books was completed in AD 77. That it was written entirely in 77 or that Pliny was finished with it then cannot be proved. Moreover, the dedication could have been written before publication, and it could have been published either privately or publicly earlier without the dedication. The only certain fact is that Pliny did no further work on it after AD 79. The Naturalis Historia is one of the largest single works to have survived from the Roman Empire to the modern day and purports to cover the entire field of ancient knowledge, based on the best authorities available to Pliny. He claims to be the only Roman ever to have undertaken such a work. It encompasses the fields of botany, zoology, astronomy, geology, and mineralogy, as well as the exploitation of those resources. It remains a standard work for the Roman period and the advances in technology and understanding of natural phenomena at the time. His discussions of some technical advances are the only sources for those inventions, such as hushing in mining technology or the use of water mills for crushing or grinding corn. Much of what he wrote about has been confirmed by archaeology. It is virtually the only work which describes the work of artists of the time, and is a reference work for the history of art. 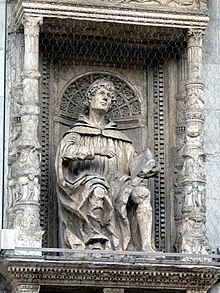 As such, Pliny's approach to describing the work of artists was to inform Lorenzo Ghiberti in writing his commentaries and Giorgio Vasari who wrote the celebrated Lives of the Most Excellent Painters, Sculptors, and Architects. The work became a model for all later encyclopedias in terms of the breadth of subject matter examined, the need to reference original authors, and a comprehensive index list of the contents. It is the only work by Pliny to have survived, and the last that he published, lacking a final revision at his sudden and unexpected death in the AD 79 eruption of Vesuvius. Pliny had received from Emperor Vespasian, who had died two months earlier, the appointment of praefectus classis (fleet commander) in the Roman Navy. 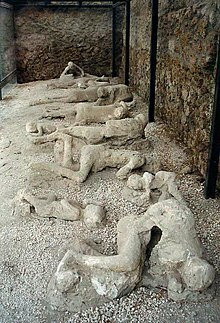 On AD August 24, 79, he was stationed at Misenum, at the time of the great eruption of Mount Vesuvius, which destroyed and buried Pompeii and Herculaneum. He was preparing to cross the Bay of Naples to observe the phenomenon directly when a message arrived from his friend Rectina asking to rescue Pomponianus and her. Launching the galleys under his command to the evacuation of the opposite shore, he himself took "a fast-sailing cutter", a decision that may have cost him his life. His nephew, Pliny the Younger, provided an account of his death, obtained from the survivors. The nephew and his mother had decided not to go on the voyage across the bay. As the light vessel approached the shore near Herculaneum, cinders and pumice began to fall on it. Pliny's helmsman advised turning back, to which Pliny replied, "Fortune favors the brave; steer to where Pomponianus is." (Stabiae, near the modern town of Castellammare di Stabia.) They landed and found Pomponianus "in the greatest consternation." Pliny hugged and comforted him. They could not find Rectina. They loaded the cutter, but the same winds that brought it to Stabiae prevented it from leaving. Pliny reassured his party by feasting, bathing, and sleeping while waiting for the wind to abate, but finally they had to leave the buildings for fear of collapse and try their luck in the pumice fall. Pliny sat down and could not get up even with assistance, and was left behind. His companions theorized that he collapsed and died through inhaling poisonous gases emitted from the volcano. On their return three days later (26 August) after the plume had dispersed, his body was found under the pumice with no apparent external injuries. The problem with the toxicity theory is that his companions were unaffected by the same fumes, and they had no mobility problems, whereas Pliny had to sit and could not rise. As he is described as a corpulent man, who also suffered from asthma, his friends are thought to have left him because he was already dead. The story of his last hours is told in a letter addressed 27 years afterwards to Tacitus by Pliny the Younger, who also sent to another correspondent, Baebius Macer, an account of his uncle's writings and his manner of life. The fragment from Suetonius (see under "External links" below) states a somewhat less flattering view, that Pliny approached the shore only from scientific interest and then asked a slave to kill him to avoid heat from the volcano. It is not as credible a source, as it is clear from the nephew's letter that the persons Pliny came to rescue escaped to tell the tale in detail. Moreover, Suetonius hypothesizes that a party witnessing events so agonizing as to destroy Pliny or cause him to order his own death are suspect as they apparently were subject to none of these fatal events themselves. In 1859, Jacob Bigelow, M.D., after summarizing the widespread misinformation about Pliny's death, examined the evidence and concluded that Pliny was overweight, in poor health, and died of a heart attack. In 1967, science historian Conway Zirkle similarly stated that "there is widespread and persisting misinformation" about Pliny's death. He suggested that despite his rescue attempt, Pliny never came within miles of Vesuvius and no evidence has been found that shows he died from breathing in fumes, and like Bigelow, concluded that he died of a heart attack. ^ a b c Pliny the Younger. "VI.16 To Tacitus". Letters. ^ a b Bigelow, Jacob, MD (1859). Littell, E., ed. "Death of Pliny the Elder". Littell's Living Age. Third. Boston: Littell, Son, and Company. V: 123. ^ Francis, Peter & Oppenheimer, Clive (2004). Volcanoes. Oxford University Press. ISBN 0-19-925469-9. ^ "Military horse trapping inscribed with the name of Pliny the Elder". The British Museum: Highlights. Archived from the original on 2013-12-03. ^ a b Gaius Plinius Secundus; Jean Harduin (commentator) (1827). "Ad Pliniam Vitam Excursus I: de Plinii Patria". Caii Plinii Secundi Historiae Naturalis Libri XXXVII. Bibliotheca Classica Latina (in Latin and French). 1. C. Alexandre; N.E. Lemaire (editors and contributors). Paris: Didot. pp. XLIX–L. ^ So also is the further speculation by Metello that she was the daughter of Titus, which suggests a possible connection with the Titii Pomponii on his mother's side, and a connection with the Caecilii (Celer was a cognomen used by that Gens) on his father's side: Metello, Manuel Arnao; João Carlos Metello de Nápoles (1998). Metellos de Portugal, Brasil e Roma: compilações genealógicas (in Portuguese). Lisboa: Edição Nova Arrancada. ISBN 978-972-8369-18-7. ^ Allain, Eugène (1902). Pline le Jeune et ses héritiers (in French). 3 (ouvrage illustré d'environ 100 photogravures et de 15 cartes ou plans ed.). A. Fontemoing. pp. 281–282. ^ This article incorporates text from a publication now in the public domain: Charles Peter Mason (1870). "C. Plinius Secundus". In Smith, William. Dictionary of Greek and Roman Biography and Mythology. 3. p. 414. ^ a b c d e f g h i j k l m n o p q r One or more of the preceding sentences incorporates text from a publication now in the public domain: Sands, John Edwin (1911). "Pliny the Elder". In Chisholm, Hugh. Encyclopædia Britannica. 21 (11th ed.). Cambridge University Press. p. 841–844. ^ Hardy, Ernest George (2007). "V Caesar's Colony at Novum Comum in 59 BC". Some Problems in Roman History: Ten Essays Bearing on the Administrative and Legislative Work of Julius Caesar. The Lawbook Exchange, Ltd. pp. 126–149. ISBN 978-1-58477-753-3. ^ Pokorny, Julius. "Indogermanisches Etymologisches Woerterbuch" (in German). University of Leiden. p. 834. Archived from the original on 2006-09-27. ^ a b c Beagon (2005) p.3. ^ Syme (1969), p. 207. ^ "XVI.2". Natural History. Many is the time that these trees have struck our fleets with alarm, when the waves have driven them, almost purposely it would seem, against their prows as they stood at anchor in the night; and the men, destitute of all remedy and resource, have had to engage in a naval combat with a forest of trees! ^ Levick, Barbara (1999). Tiberius the politician (2, revised, illustrated ed.). Routledge. p. 290. ISBN 978-0-415-21753-8. ^ a b c d e f g h i j Pliny the Younger. "III.5 To Baebius Macer". Letters. ^ Griffin (1992), p. 438. ^ "XXXIII.50". Natural History. to my own knowledge, Pompeius Paulinus... had with him, when serving with the army, and that, too, in a war against the most savage nations, a service of silver plate that weighed twelve thousand pounds! ^ "VIII.65". Natural History. Those who have to use the javelin are well aware how the horse, by its exertions and the supple movements of its body, aids the rider in any difficulty he may have in throwing his weapon. ^ Tacitus. "I.69". The Annals. ^ Syme (1969), p. 224. ^ Griffin (1992), p. 439. ^ Syme (1969), p. 225. ^ "III.5 (.4)". Natural History. ^ Syme (1969), pp. 214-215. ^ "XXV.76". Natural History. I myself have seen the Psylli, in their exhibitions, irritate them by placing them upon flat vessels made red hot, their bite being fatal more instantaneously than the sting even of the asp. ^ "XXXV.48 (14.)". Natural History. 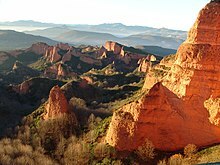 ^ "III.4 (.3) Of Nearer Spain". Natural History. ^ Syme (1969), p. 216. ^ "XXXIII.21". Natural History. Asturia, Gallæcia, and Lusitania furnish in this manner, yearly, according to some authorities, twenty thousand pounds' weight of gold, the produce of Asturia forming the major part. Indeed, there is no part of the world that for centuries has maintained such a continuous fertility in gold. ^ "XVIII.49 (.19)". Natural History. ^ Syme (1969), p. 213. ^ Seneca the Younger. "30". Moral Letters. ^ Hill, Timothy (2004). Ambitiosa mors: suicide and self in Roman thought and literature. Studies in Classics Volume 10. Routledge. p. 179. ISBN 978-0-415-97097-6. ^ Seneca the Elder. "6.18.23". Suasoriae. ^ Tacitus. "13.20". The Annals. ^ Tacitus. "15.53". The Annals. ^ Tacitus. "3.29". The Histories. ^ Pliny. "Preface, 20". Natural History. ^ a b Beagon (2005), p. 7. ^ "Roman Emperors - DIR Titus". ^ The New Encyclopædia Britannica. 14 (15 ed.). 1977. p. 572a. ^ Bigelow, Jacob. (1859). the Death of Pliny the Elder, Memoirs of the American Academy of Arts and Sciences Vol. 6, No. 2 (1859), pp. 223-227. ^ Zirkle, Conway. (1967). The Death of Gaius Plinius Secundus (23-79 A.D.). Isis 58: 553-559. Beagon, Mary. (1992). Roman Nature: The Thought of Pliny the Elder. Oxford: Oxford Univ. Press. Beagon, Mary (translator) (2005). The elder Pliny on the human animal: Natural History, Book 7. Oxford University press. ISBN 0-19-815065-2. Carey, Sorcha (2006). Pliny's Catalogue of Culture: Art and Empire in the Natural history. Oxford University press. ISBN 0-19-920765-8. Doody, Aude. (2010). Pliny’s Encyclopedia: The Reception of the Natural History. Cambridge, UK, and New York: Cambridge Univ. Press. Griffin, Miriam Tamara (1992). Seneca: A Philosopher in Politics (reprint ed.). Oxford University Press. ISBN 978-0-19-814774-9. Fane-Saunders, Peter. (2016). Pliny the Elder and the Emergence of Renaissance Architecture. New York: Cambridge University Press. French, Roger, and Frank Greenaway, eds. (1986). Science in the Early Roman Empire: Pliny the Elder, His Sources and Influence. London: Croom Helm. Gibson, Roy and Ruth Morello eds. (2011). Pliny the Elder: Themes and Contexts. Leiden: Brill. Healy, John F. (1999). Pliny the Elder on science and technology. Oxford University Press. ISBN 0-19-814687-6. Isager, Jacob (1991). Pliny on Art and Society: The Elder Pliny's Chapters on the History of Art. London & New York: Routledge. ISBN 0-415-06950-5. Laehn, Thomas R. (2013). Pliny’s Defense of Empire. Routledge Innovations in Political Theory. New York: Routledge. Murphy, Trevor (2004). Pliny the Elder's Natural History: the Empire in the Encyclopedia. Oxford University Press. ISBN 0-19-926288-8. Ramosino, Laura Cotta (2004). Plinio il Vecchio e la tradizione storica di Roma nella Naturalis historia (in Italian). Alessandria: Edizioni del'Orso. ISBN 88-7694-695-0. Syme, Ronald (1969). "Pliny the Procurator". In Department of the Classics, Harvard University. Harvard studies in classical philology (illustrated ed.). Harvard University Press. pp. 201–236. ISBN 978-0-674-37919-0. Pliny the Elder; William P. Thayer (contributor). "Pliny the Elder: the Natural History" (in Latin and English). University of Chicago. Retrieved 24 May 2009. Pliny the Elder (1855). "The Natural History". John Bostock, Henry Thomas Riley (translators and editors); Gregory R. Crane (Chief editor). Taylor and Francis; Tufts University: Perseus Digital Library. Retrieved 24 May 2009. Fisher, Richard V. "Derivation of the name 'Plinian'". University of California at Santa Barbara: The Volcano Information Center. C. Suetonius Tranquillus (1914). William P. Thayer, ed. "The Life of Pliny the Elder". Loeb Classical Library. Lendering, Jona (1996–2009). "Pliny the Elder (1)". Livius Articles on Ancient History. Retrieved 15 May 2009. Lendering, Jona (1996–2009). "Pliny the Elder (2)". Livius Articles on Ancient History. Retrieved 15 May 2009. Pearse, Roger (2013). "The manuscripts of Pliny the Elder". Tertullian.org. Retrieved 22 June 2013. Online Galleries, History of Science Collections, University of Oklahoma Libraries High resolution images of works by Pliny the Elder in.jpg and.tiff format.